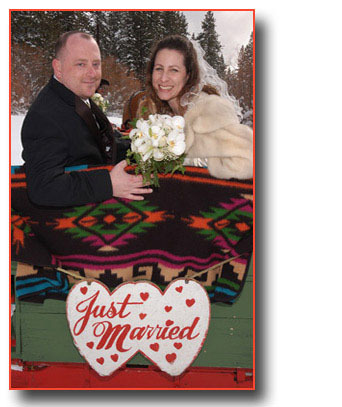 Winter is the perfect time of year for a sleigh ride wedding in Lake Tahoe and a fun way to glide down the hoary corridor of wedlock. The Borges family has had a tradition of offering sleigh rides in Tahoe since the 1960’s, allowing brides and grooms to experience their wedding day in the midst of the snowy countryside. Ride a one horse open sleigh drawn by a 2,000 pound Blonde Belgian or similar mount across the snow-covered meadow to a scenic location for your white winter wedding. The atmosphere is one of romance and beauty as you are surrounded by the towering Sierra Nevada Mountains in an unprecedented serene setting. Photo opportunities are plentiful and taken during and after your ceremony, which will provide lasting memories of a very unique and special day. 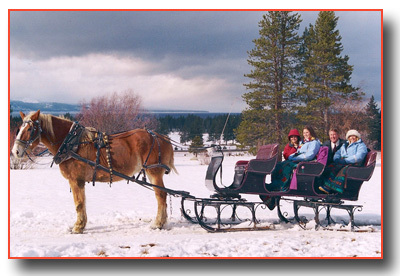 Package price includes four sleigh ride tickets – one each for the bride, groom, minister, and photographer. Additional tickets for guests can be obtained on the day of the wedding and will cost about $50 each (price is subject to change and may vary). Small groups of up to 10 people are recommended.